More than 40 years ago I bought my first two The Enid (vinyl) albums in a specialized record store in Amsterdam. I have always followed the band but had to wait for more than 35 years to see the band performing live on a Dutch stage in Uden, The Netherlands. It was the first resurrection of the band with new singer Joe Payne and original members Dave Storey and Robert John Godfrey. The band gave a wonderful performance for only 50 die hard fans but at the following Dutch gigs that I attended it was a full house. In my 2012 review of the album “Invicta” I wrote the following; Robert John Godfrey must be proud of his boys ... the new incarnation of The Enid has a bright future. Fast forward to the year 2017. After the departure of original members Robert John Godfrey and Dave Storey and in a later stadium also the departure of the couple Max Read and Joe Payne, Jason Ducker and Dominic Tofield are the only familiar names now. The next incarnation of the band counts only three members. Besides the already mentioned Jason Ducker and Dominic Tofield we can find the name of Zachary Bullock on this new album entitled “Resurgency”. He is responsible for the vocals and all the keyboards. A very bold decision of the boys to continue the band and keeping the music alive ... the legacy of The Enid. 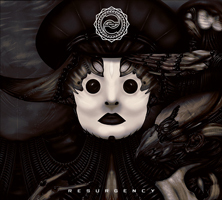 “Resurgency” is a crossover album, a bridge between the old and the new. The band selected some of the standout tracks from the Trilogy of albums “Journey's End”, “Invicta” and “Dust”. The album comes in a beautiful digipak. But you will notice that the atmosphere of the artwork (and the new website) is more darker than we were used to see. I think that this is a thoughtful decision. My first impression is that the sound of the band is also darker and a little bit heavier. Dominic Tofield is the graphic designer of the artwork, a talented guy! The opener “Reborn In The Fire” (a song from “Dust”) is a song that grabs back to the old good days of the first line-up. The second thing I notice is that that mix is a little bit dry, not as sparkling as the previous albums. But this said, it is remarkable that Jason Ducker besides composing, programming and playing the guitar parts is now also responsible for the mix of the album. This talented guy must have an amazing learning curve. I think he is doing a wonderful job. I was very happy with the special 5.1 surround mixes that Max Read made of the last two albums, so I hope that Max continues with that. The next piece “Space Surfing” is a song from the “Journey's End” album. That song in which the band made use of a vocoder for the vocal harmonies. As always the keyboard orchestrations are amazing. And I find that some of the instrumental parts have a more modern feeling. “Malacandra” is also from that “Journey's End” album. With almost 13 minutes it is the longest track of the album. The first part has fairytale like atmospheres that for me has a connection to one of my favorite The Enid albums. Yes I am talking about the wonderful “Aerie Faerie Nonsense” album. A beautiful orchestrated piece of music with some great drumming of Dominic Tofield and nice guitar work of Jason Ducker. I am wondering how these three guys will bring this piece in a live setting. “Malacandra” is typical The Enid piece with some references to the old days. “Leviticus” is one of the best tracks of the “Invicta” album. I must give Zachary Bullock a big compliment for his vocal performance on this album. It is almost impossible to replace the excellent singer Joe Payne. In a live setting we will probably miss his stage presence, but that is another story. “Terra Firma” is another track from the “Journey's End” album. This rhythmic piece of music has a lot of vocal parts and Jason Ducker impressed me with all the guitar parts. This piece has a lovely flow. “Who Created Me” from the “Invicta album” has beautiful vocal lines, but this version is in my opinion to much vocoder based, I am not convinced. I like the vocals more in the next piece “Witch Hunt” which is also from the “Invicta” album. You can find the track “Someone Shall Rise” on the “First Light” and “Dust” (the 2014 version) albums. Wisely the band has now opted for an instrumental version. It was a song in which singer Joe Payne was shining .... and there is only one Joe Payne. But the nice melodies of this song are working fine in this instrumental version. The “Resurgency” album closes with the “Journey's End” song “Shiva”. In this piece you can find wonderful keyboard parts. Zachary is doing a wonderful job, in fact he has to replace two keyboard players. Again the question of the live performances is rising ... how will he do this. “Shiva” with the uplifting melodies and great ending is a worthy ending of this crossover album. This is a difficult period in the existence of the band The Enid. I hope that the fans will continue to support the band and give this trio a chance to develop their own sound and at the same time preserve the legacy of The Enid. The band got a lot of new fans when Joe Payne was stealing their hearts at the live gigs, and I am curious about the effect it will have ... I mean the changed line-up. The vocals were of course the biggest challenge for the band. On this album the band is heavily depending on the use of the vocoder. At some point I got the feeling that it was getting a little bit too much. But on the other hand I am impressed with the work of these three talented guys. The music is still typical The Enid and very recognizable. The music sounds a little bit darker. Please give the boys the chance to resurrect the unique concept of The Enid one more time.